Q: Do you have any vacant sites available? A: We currently have 8 vacant sites. Some sites are smaller and will only accommodate a 70′ home, but others are large enough to accommodate a double-wide home with a 2-car garage. Q: How much is your site rent? A: Site rents range from $220 – $270 per month. Q: How do taxes work? A: Taxes are paid monthly at the same time you pay your rent. Your tax amount is based on the value of your home. For example the approximately monthly tax on a $35,000 home is $60/mo; on a $55,000 home the tax would be $94/mo. A: We allow both cats and dogs; some restrictions apply. Q: What is included with rent? A: Free access to The Pines Clubhouse and Fitness Center, which has free wi-fi and exercise equipment that includes a treadmill, recumbent bike, free weights, and an elliptical machine. The Clubhouse also has 2 large-screen TV’s, a kitchen, and three game tables. Q: How do utlities work? A: All utilities are metered at the home. Trempealeau Muncipal Utilities will bill you for electricity usage. ABT Water will bill you for water and sewer charges. Midwest Natural Gas will bill you for natural gas usage. Q: Can I build a garage? A: Yes, provided the site you have chosen is large enough to accommodate a garage. Q: Do you allow basements? We may ask for your contact information, including items such as name, address, email address, and telephone number. This information is only used to respond to your inquiry about our property. 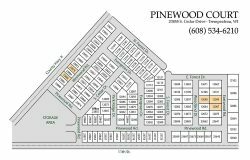 Pinewood Court, Inc. may publish a tenant’s testimonial, but will obtain the authorization of the tenant before publishing any testimonial on its website. In no case does Pinewood Court, Inc. sell, share or rent out your stored data to third parties, nor does it use them for any purposes other than those outlined in this Policy. Pinewood Court, Inc collects your personal data for the requirements of carrying out its contractual obligations as well as information about how and when you use our services, and we retain this data in active databases, so long as you use our services. Pinewood Court, Inc in no way undertakes to store your data indefinitely.